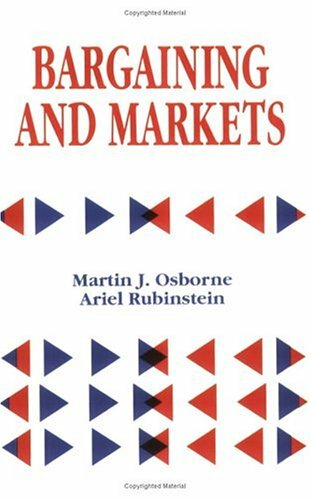 Bargaining and markets by Martin J. Osborne and Ariel Rubinstein was published in 1990 by Academic Press, now a division of Elsevier. It presents the modern strategic theory of bargaining and describes, in a consistent framework, several applications of this theory to the study of markets. It uses a small number of models to illustrate the key points in the theories and offers detailed proofs of all results. The greatest failing of non-Austrians theories of macroeconomics is that they lack a robust theory of capital. F.A. Hayek sought to fill out the theory of the business cycle with an impenetrable one, and the result was this remarkable 1941 treatise. 'Do not steal' is the first principle of sound economic systems. The topics covered by Hoppe are wide ranging: employment, interest, money, banking, trade cycles, taxes, public goods, war, imperialism, and the rise and fall of civilizations.